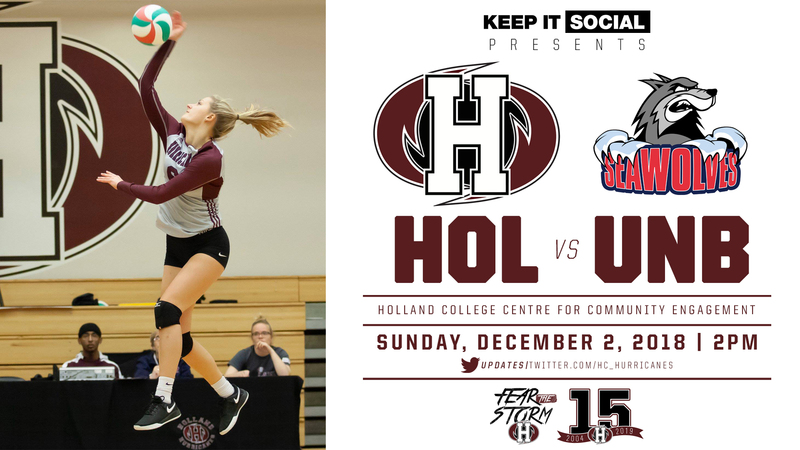 The Holland Hurricanes begin a busy weekend this evening at the Holland College Centre for Community Engagement when the women’s volleyball Hurricanes host the Mount Allison Mounties; first-serve is scheduled for 7pm. The action continues on Saturday as the ACAA concludes its first semester this weekend before breaking until the new year. 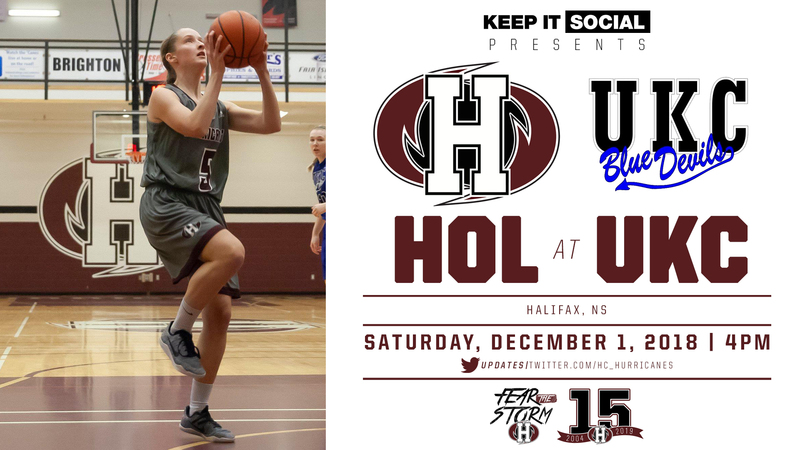 The basketball Hurricanes will be in Halifax, Nova Scotia for games versus the UKC Blue Devils on Saturday and the MSVU Mystics on Sunday, while the men’s and women’s volleyball ‘Canes will host the UNBSJ Seawolves on Sunday. 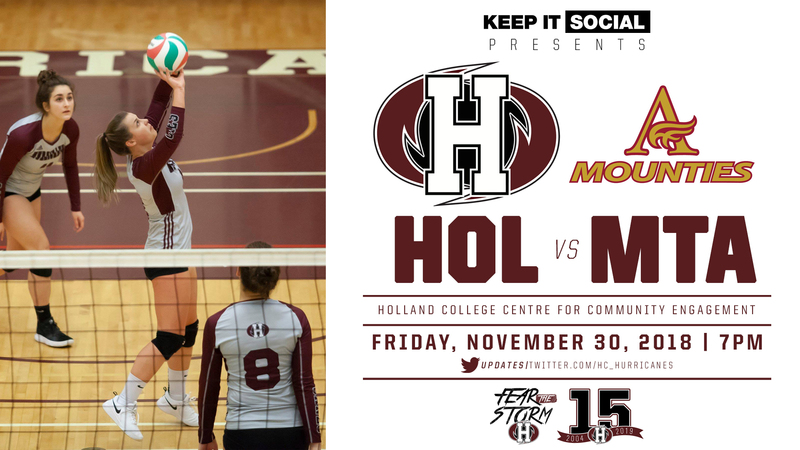 Friday evenings women’s volleyball match features the third-place, Holland Hurricanes (5-3), hosting the second-place, Mount Allison Mounties (7-2). This is the second time these teams have met this season, with the Hurricanes taking the October 28 meeting in straight-sets in Charlottetown. The ‘Canes will look to get back on track after losing two of their last four matches while the Mounties have won six of their last seven. 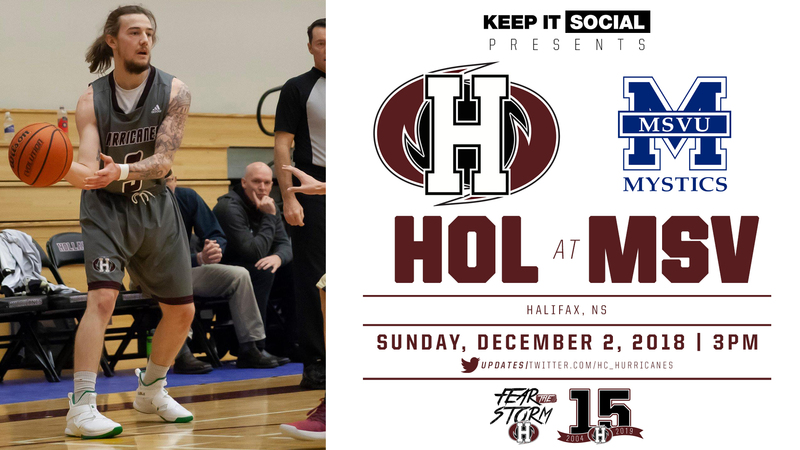 Holland College has been strong at home this season, going 2-0, while the Mounties two losses this season have come on the road; they have a 3-2 record outside of Sackville, New Brunswick. Statistical leaders to keep an eye on during tonight’s match are Brittany States (61 kills) and Katie Wood (99 digs) for the Hurricanes, while Rachel Van Gestel (49 kills) and Sophie Landry (55 digs) have had strong seasons to-date for the Mounties. Friday’s game will also feature special events like a Holland College residence challenge. The residence building with the highest percentage attendance will receive a pizza party. Students can enter by submitting their ticket at the main entrance of the Holland College Centre for Community Engagement. Other activities include contests, noise makers and performances by the Hurricanes Dance team. 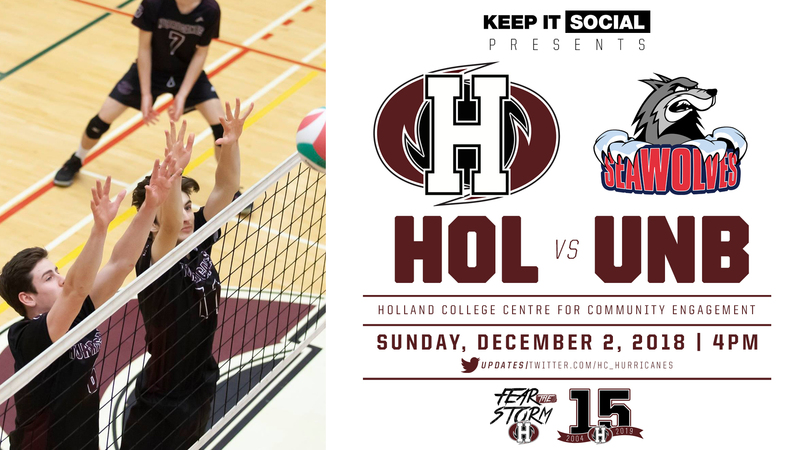 The women’s Hurricanes will close out their 2018 with a 2pm match versus the UNBSJ Seawolves on Sunday at the Holland College Centre for Community Engagement. Entering the weekend, the Seawolves are tied with the ‘Canes for third place in the ACAA with a 5-3 record. The only previous matchup between these two teams came on November 10 in Saint John, NB, when the Seawolves earned the five-set victory. The men’s volleyball Hurricanes take the court at 4pm on Sunday when they also host the UNBSJ Seawolves. The Seawolves, who take on the STU Tommies on Friday evening, are currently 3-2 and in second place in the ACAA, while the Hurricanes are 2-4 and in third. Their previous meeting this season took place on November 10 when UNBSJ walked away with the five-set victory in Saint John, NB. Brett Butler has been the player to watch for the Hurricanes this season (78 kills and 49 digs) while Zane Hamilton (45 kills) and Ryan Farrell (49 digs) have been statistical leaders for the Seawolves. After this weekend, the men’s and women’s volleyball Hurricanes will return to action on January 12, 2019, when the women host the Université de Sainte-Anne Dragons at the CCE, while the men will visit the Seawolves in Saint John, NB. In basketball action, the men’s and women’s Hurricanes will visit the UKC Blue Devils on Saturday with the women’s game beginning at 4pm, and the men’s to follow at 6pm. The women’s Hurricanes enter the weekend at 3-3 and in a tie for fourth place with the Blue Devils (3-4). The ‘Canes are coming off a 76-61 victory over UKC on November 18 in Charlottetown. The game will feature a battle between the high-powered Hurricanes offense, who are second in the ACAA, averaging 74.5 points per game, and the solid defensive play of the Blue Devils, who are second in the ACAA, allowing only 49.7 points against per game. Lexi MacInnis has been the offensive player to watch for Holland College this season, she’s averaged 16.5 points per game while Heather Wall has led the Blue Devils with 10 points per game. 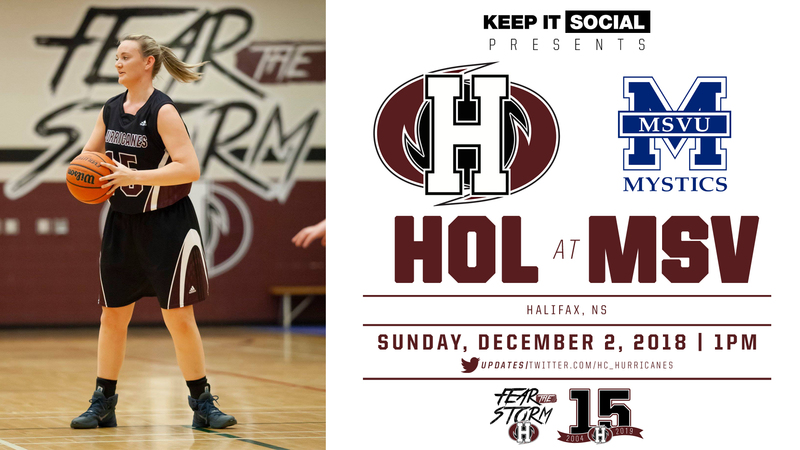 The action continues on Sunday at 1pm when the Hurricanes visit the 7-0, first-place, MSVU Mystics. The Mystics have been the ACAA’s top team so far this season, leading the conference by averaging 87.1 points per game while also allowing the fewest; an average of just 44.1 points per game. Maria Carroll has led the Mystics this season, averaging 17.5 points per game. This will be the first meeting between the ‘Canes and Mystics this season. The men’s Hurricanes have been the team-to-beat in the ACAA so far this season, they enter the weekend at 6-0 and in first place in the conference. The ‘Canes defeated the Blue Devils (3-4, fifth) on November 18 in Charlottetown, 120-65, in their only previous matchup this season. Campbell Colpitts has been the offensive leader for the Blue Devils so far this regular season, averaging 19.8 points per game. All eyes will be on Sunday’s matchup, when at 3pm, the ‘Canes will take on the 6-1, MSVU Mystics. Both teams are tied at the top of the ACAA standings with 12 points. This will be the first meeting between the two teams this season. This will be an interesting matchup, pitting the high-powered Hurricanes offense (averaging 114 points per game, first in ACAA) as they take on the ACAA’s top defence of the MSVU Mystics. The Mystics have allowed an average of just 62.7 points per game to-date. Jace Colley has led the ‘Canes this season, averaging 26.3 points per game while Liam Mitchell has led a balanced offensive attack for the Mystics, averaging 11.7 points per game. 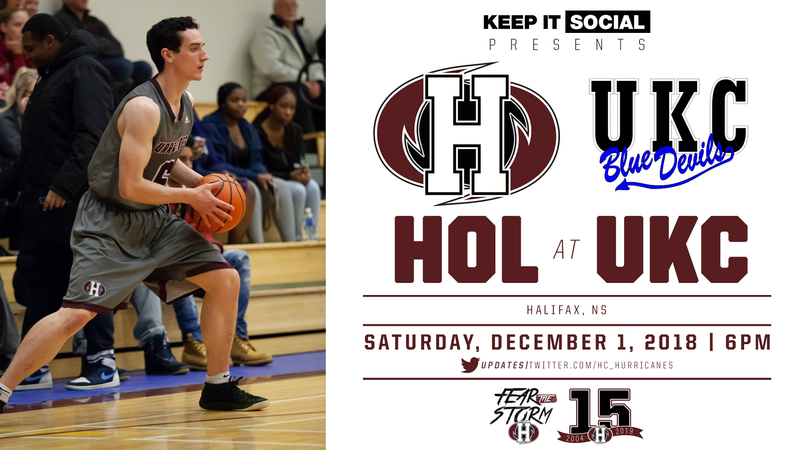 The basketball Hurricanes will begin the 2019 portion of their regular season on Saturday, January 12 when they travel to Saint John, NB to take on the UNBSJ Seawolves. Catch all the weekend action by visiting www.acaatv.ca to watch live. Connect with the basketball and volleyball Hurricanes by visiting the following links; www.twitter.com/caneswvball, www.twitter.com/canesmvball, www.twitter.com/caneswbball and www.twitter.com/canesmbball. For more information on the Holland Hurricanes, please visit www.hollandcollege.com/athletics, www.facebook.com/hollandhurricanes, www.twitter.com/hc_hurricanes and www.instagram.com/hollandhurricanes.